I’ve started a C.S.A., Community Supported ARTiculture….and you might consider becoming either a working, non-working member, or to figure out what level of membership you can support. August is the O’k C.S.A. membership drive month, with the “growing season” beginning this September through May 2009. All the details are attached in the two documents below, and you can also get updates on my continued work with Little Artshram and my O’k C.S.A. at the web addresses below. If you would like me to snail mail this information to you, please send me a quick email and I’d be happy to. I haven’t sold out completely to techno communications. About to be a Fat-Pie for the Biker…. 10 inch pie, baked at 425 degrees for 15 minutes, then 350 for 40 minutes. Mix all the filling ingredients together and let stand for 20-30 minutes before filling pie shell. I always put 5-6 chunks of butter on top of the filling, before putting on the top crust. This pie looked WONDERFUL when I packed it up to send it to Washington, express mail. It’s supposed to arrive by 3:00 Wednesday, and I sure hope they don’t toss it around on the plane or drop anything on it. This is a serious, good pie for a special occasion, and I’m trusting the U.S. Post to come through for me…..
My first special, fat-pie delivery is baking in the oven and later today will be boxed up and shipped 3000 miles across the country to my dear-heart friend and bike-rider, Matt. All along on his journey–which began here in Traverse City, on June 5th, I promised him a pie when he got where he needed to be and had a mailing address…. a supportive form of encouragement to keep him pedaling on. I’d planned on sending him one while he was heading across Montana, tangling with the wind, across the Great Plains of North Dakota. He may have been on the verge of giving me a mailing address, when he began with this description, “Penny, I’m standing on the edge of a canyon, there’s sheep all around me and I’m looking at the Rocky Mountains…..” Then his phone went dead. I didn’t hear from him for almost two weeks! During that time, I baked a few pies for our weekly Farmer’s Market and was keeping myself busy in our Teaching and Market gardens, and with the Art-Farm camps. Almost every evening I’d pedal my bike across town to a wild, urban place where I discovered a nice patch of black raspberries. I harvested LOT’S over the course of two weeks, and packed them away in my freezer. I also harvested a bunch of mulberries, which grow abundantly in many places around TC, with a particularly wonderful tree near McGoughs’ Feed Store and Oryana Co-op. I discovered a GIANT Mulberry tree down the alley from my house–something I walk or ride my bike under almost every day. It’s a little tricky to pick from, because the city keeps it trimmed high….but there was no missing it as the berries became ripe and dropped down all over the street. Matt arrived in Washington state a week or so back, and with a mailing address in Duvall, WA, now it’s time to test out the mail-ability of my good, fat-pie and celebrate his strong legs and amazing accomplishment. I’m packing up a 10 inch, organic cherry, & hand-picked mulberry and black raspberry fat-pie today. Some O’k Art stories and a C.S.A. This is the time of summer when an evening storm happens, as it did last night fierce, flashing like an angry sky-tiger with little rain. Marley, my good dog barked at the thunder-dogs most of the night. Today, the morning sun rises and the air is already regathering a level of humidity that makes me feel rushed into another potentially surley day. I imagined walking my good dog over to the gardens and giving her a little rub-down, scrub-down bath in the creek….but I wonder if it will be too much, too hot for her to walk the 3 miles there and back. I worked at our community gardens, doing the daily, heavy task of filling our water barrels from the creek with Lou the bandonian playing tango, radio man, and Market garden manager Tuesday morning. This necessary, hand-watering and hauling watering task on a good day, with the generous use of another gardener’s truck and trailer (Lou and I are both bike-riders) is usually accomplished with the help of our younger, muscled market-garden interns and can take up to three and a half hours. We don’t have a well in our garden, but there is wetland and water all around it. the land is owned by the city and a Rec. authority and the powers that be are, just beginning to make decisions about what goes where and who is doing it….even though community gardens have been on the property for more than five years. when it rains, we catch water off our Little a workshop roof, in our cobbled together catchment system (an old garage when the farm was in full-use)….but we are not getting good steady soakers, just spatterings, which is helpful, but not enough. hello, rain, our sweet, earth-friend. Yesterdays’ water hauling job was more like a five hour task, in that surley, humid pre-storm heat. In the presence of the creek, which is shaded by two champion, black willow trees, this hard work of five gallon-bucket-by-bucket hauling of water up and into our barrels is managable and in the company of another, a good time to chew on the fat. As Lou and I filled 12, 50-gallon barrels, we laid out a few more details and ideas(there will be a well and irrigation system next growing season) about our business plan for continuation and expansion of the market garden/c.s.a. work, and caught up on recent “confidential” developments unfolding in our home-lives with relationships and new living quarters. Lou is a good, a hard-worker, a self-starter, with lot’s of juggling of creative energy and projects, and sometimes hard-headed like me. So despite the tough, laborous work it was good. We call it our privileged, Northern Michigan, third-world reality check. Came home ravenously hungry, fixed a cheese burger from Earthwork Farms beef, with a big slice of a wonderful heirloom tomato and mustard greens from the garden, drank a cold sweaty-betty beer and laid down for an afternoon nap with the fan whirring away. I don’t quite have my groove… I’m living another and different life in town with my transport system of bike and cart–a car-less human being—being out under and with the elements…spending most of my work-days outdoors… in the garden, at the art-farm workshop or biking from one errand/meeting/job to another. Good, character building challenges. I move around a whole lot, and put on a lot of foot and biking miles. Much more than I have, with this 49-year old body in a good long while. My sitting still, slowing down yoga practice has been put aside. The most I sit is at this computer…usually in the earlier morning like now –or not quite like now…Anyways, I try to do a yoga version of the administrative tasks of Little a, which have increased greatly with the addition of the apprentice/intern market garden program, and, with the continuation of the planning/development of our permanent home-space on the 54-acre barns property. 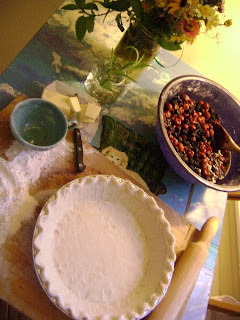 As I continue to side-step my solo non-profit job of directressing Little a, and re-connect to my life-long creative efforts to fund my life as an artist and teacher, I’ve written a business plan, and had a pie-social to kick off the beginning of my O’k C.S.A., with a half-block section of the street party a few weeks ago. We had a plethora of pies, most of mine were fruit-filled and I even broke down and made a cherry pie, Bev brought a onion pie, there was a square-pie, and an amazing vegan-Fig and Coconut Milk pie….two, eight foot tables filled, and only one slice left at the end of the evening. Neighbor Nic and my son Zach started the music-making and singing with one my favorite Neil Young songs—Hello, Cowgirl in the Sand…. And then Zach went into a good lengthy set of his songs, which made my fat-pie heart swell. Anyways, you might have been there. And, it was a lovely evening, thank you. So at a time when I’m side-stepping the management and solo-directing of a growing non-profit, I’m still sticking with the continued development of Little Artshram’s mission, both teaching/learning and spreading the Permaculture Art-Farming wisdom, and plan on continuing my work with curriculum planning and teaching. A new administrative, Exec. Directress will be taking over that growing position, within the next three months. My title presently is “Penny” or “O’k”…and I’m juggling the final weeks of our Summer Art-Farm camps and our weekly Market-Garden work and selling a few pies at the Friday Village Farmers Market across and inbetween, Pleasanton Bakery and Higher Grounds Coffee. AND, this is where my life as a resident art-farmer has sprouted…..I’ve started a C.S.A., Community Supported ARTiculture….and you might consider becoming either a working, non-working member, or to figure out what level of membership you can support.